Keep hot foods hot with these Vollrath Mirage buffet induction warmers! The benefits are endless and one single power cord can run up to 7 induction warmers to ensure everything is piping hot at your buffet. Welcome to Vollrath University. I'm Chef Rich, and we're here today to talk about mirage induction. But first, let's just talk a little bit about how induction works. Okay, induction uses electromagnetic energy to create a vibration between the molecules in the pan itself. The induction units themselves do not create any heat; they don't get hot, they don't have any heat, there's no heating elements or flames used. 100% of the heat is created in the pan itself. So as I said, there's this electromagnetic energy that causes the molecules in the pan to vibrate, much in the same way when we're cold, we rub our hands together to create fiction and to create heat.... That's exactly the way induction works. This unit, the mirage unit... we'll talk a little bit about the controls. We have 100 power level settings, okay? We can also cook by temperature. The temperature range on this unit is 60 to 210 degrees Celsius. Again, we have 100 power level controls, and that's really important as you want to get into that very precise control. Precise control for low-end applications, and also precise control for very high heat applications. Okay? So let's just go ahead and demonstrate this unit today by cooking a little chicken marsala. Now, we didn't talk about a couple other things about induction, one being very little emissions. So, you know, depending on your municipality, you may or may not need this unit to be under a hood. In some municipalities you can get by without this unit being in a hood. Why would someone want to use induction? Induction is safer. Just by the way, we talked about it already... that it doesn't have any open flames or heating elements. The units never really ever get hot. The heat is generated in the pan, so they are much safer to use. Induction does require for the cookware to be magnetic. Simply the bottom of the cookware has to be a magnetic surface to allow those molecules to be excited by the electromagnetic energy that the unit's producing. Also induction... you can see this unit... really cool on the outside here again... you don't have much heat loss coming out, so again, the hood.... Also, look at this how nice this is if you're doing front of the house cooking. Front of the house or back of the house is a perfect location for induction. Alright, so there you have it, a very classic chicken marsala. Mirage induction. Again, a perfect range for front or back of the house cooking. All the tight control you have with (1) 100 power settings, or temperature settings. Mirage induction, really the way to go. 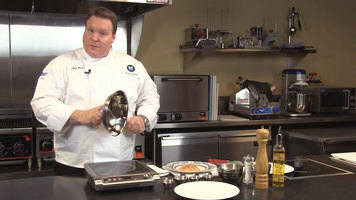 If you have any questions about the mirage unit, please see us online at vollrath.com, and for Rich's recipe on the chicken marsala, please visit us at vollrathuniversity.com. 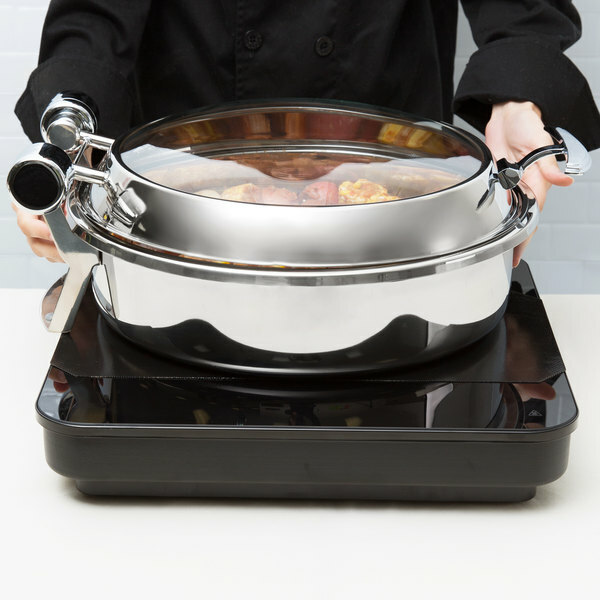 Did you know that induction is a safer way to cook than with traditional methods? With no flame and with no heating element, induction is, as Chef Rich says, "really the way to go." 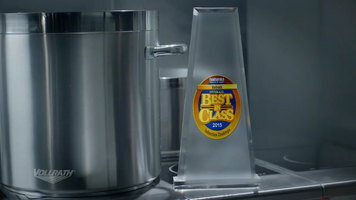 Find out more about induction and the Vollrath mirage induction unit with this brief, informational video. 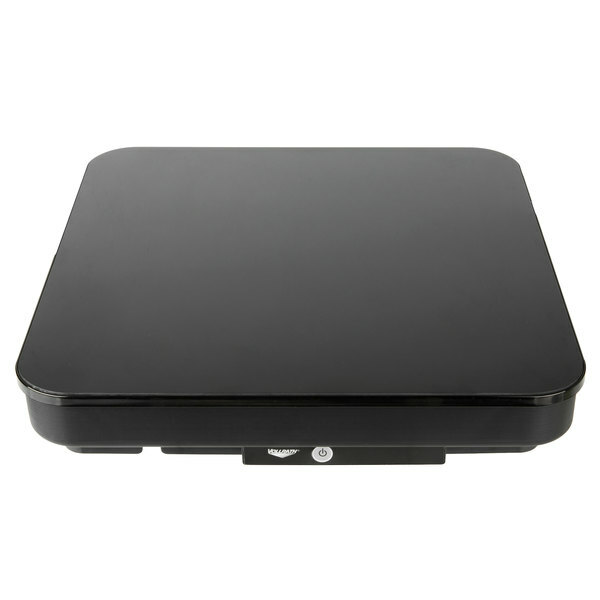 If you want to maximize your menu offerings at your buffet or catered event, then the convenience and efficiency of this Vollrath 5950275 Mirage black countertop induction warmer will fit the bill! 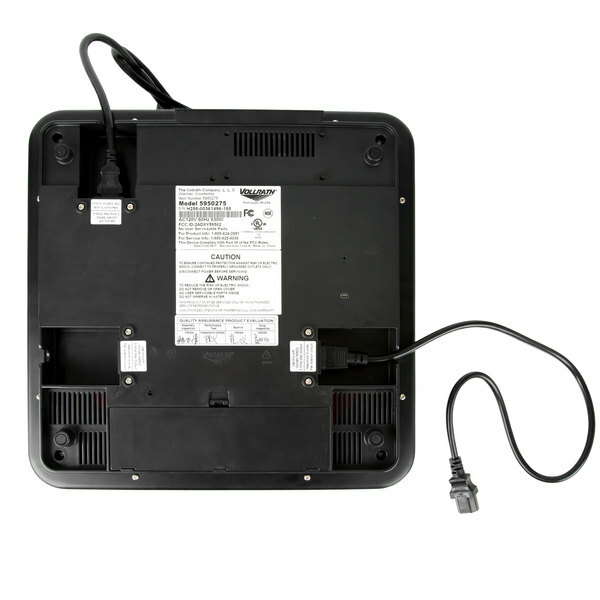 This unit can be interconnected with other Mirage warmers with the included interconnect cords and gives you the flexibility to operate up to five warmers at maximum power on just one 15 amp circuit. The LED indicator lights on the control panel and glass top combined with the touch controls take the guesswork out of regulating the heat output of your unit. 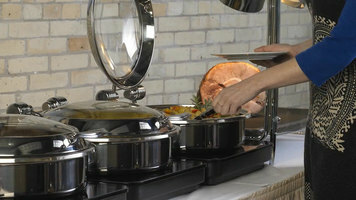 Plus, this warmer features four power levels including low, medium, high, and chafer preheat for customizable results. 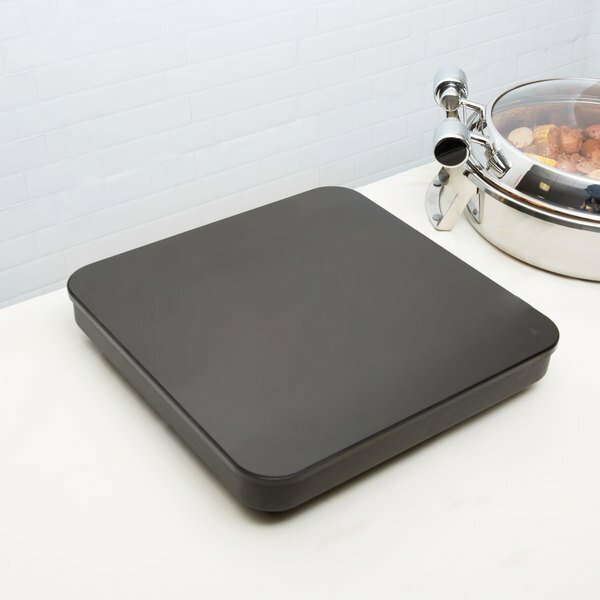 This countertop induction warmer's tempered black ceramic glass top can accommodate induction-ready pans up to 10 1/4" in bottom diameter and is non-porous to make your job easier when it's time to wipe it down at the end of the day. A convenient storage compartment is also located in the bottom of the warmer to hold cords while they are not in use for hassle-free transport and storage. Thanks to a number of safety features including overheat protection, small-article detection, pan auto-detection, and empty pan shut-off, this unit is safe for nearly any operator to use! 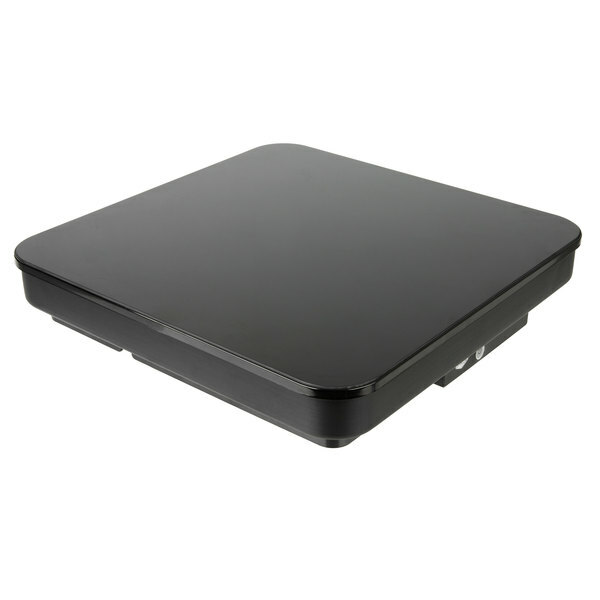 This Mirage induction warmer requires a 120V electrical connection and has a power output of 300W.